ATTENTION! BREAKING NEWS FROM WESSEX PRESS! 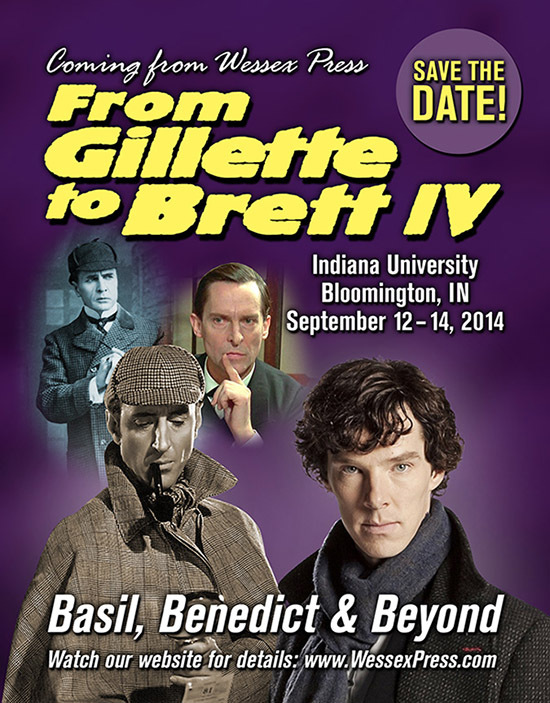 Wessex Press is pleased to announce another in its series of blockbuster Sherlockian conferences, FROM GILLETTE TO BRETT IV: BASIL, BENEDICT, AND BEYOND. Devoted to Sherlock Holmes on stage, screen, television, and radio. From Gillette to Brett IV will feature rare Sherlockian films, vendors, and an all-star roster of distinguished speakers, presenters, and events. The conference will be held on the beautiful campus of Indiana University at the Indiana Memorial Union. We are thrilled to present exclusive, 75th Anniversary screenings of Basil Rathbone's THE HOUND OF THE BASKERVILLES and THE ADVENTURES OF SHERLOCK HOLMES in the state-of-the-art IU Cinema www.cinema.indiana.edu. Watch this site for future announcements! BUT MARK YOUR CALENDARS NOW! From Gillette to Brett IV will feature an exclusive Sherlockian Cinema Exhibit!